Plenty of systems available from Pong to Playstation and everything in between. Now if I can only untangle all these wires. The extensive lists of video games, systems and accessories below are just a portion of what we have in stock. We make sales and purchases every day so our INVENTORY CHANGES DAILY. Unfortunately we do not have time to update our web page as often as we should so feel free to ask for games you are looking for that aren’t listed. Keep in mind that high demand and rare items sell fast. When we receive an order we physically pull the items to confirm we have them. This can be time consuming for us but insures you don’t pay us for something we don't have only to have to refund you afterwards. When you enter an order through our secure order form (button is above) you are not charged anything until the order is completed. There is a real live person here reading the orders. You don’t pay anything until the order is ready to ship. BEFORE CONTACTING US PLEASE READ THE ANSWERS TO OUR FREQUENTLY ASKED QUESTIONS AT THE BOTTOM OF THIS PAGE TO SAVE TIME. I GET THESE SAME QUESTIONS PHONED & E-MAILED TO ME EVERY DAY AND THE ANSWERS ARE ALREADY HERE FOR YOU. BUYING/TRADING for your games and systems. E-mail detailed description of what you have and asking price. We will even pay your shipping on large deals or things we really need. Please don't hesitate to contact us if you have anything to sell. No deal is too large. 1) Is anyone there?? Is your web site active and are you still selling video games?? Yes I assure you I am here and very busy sending customer orders. 2) Does this item I want to buy work? YES everything we sell is tested and working. All systems are tested before we put them up for sale. We guarantee the items will work when you receive them. Keep in mind many of these items are used and 10-30+ years old so they may have some cosmetic wear from use. Any major flaws are noted here or we will inform you of them when you want to purchase. WARRANTEE – I am a reasonable person. In the unlikely event that you get something that you have a problem with contact me right away. I can usually troubleshoot it with you and get the problem solved. In the extremely highly unlikely event that we can’t get it working we do an exchange. Contact me within a week or 2. If you contact me months/years after you bought it, sorry, that’s not reasonable when we are dealing with old electronics. Item left here working and I have no control how you treated it once you got it. I get e-mails all the time from customers thanking me because they bought a system years before and it still works great. Then once in a blue moon I get an e-mail from someone that bought a system from me in 2002 and now 1 button on 1 controller isn’t working wanting to know what I am going to do about it. 3) Does this item I want to buy come with original box and instructions? If item description says in box and/or with manual then yes, if not then no. Simple enough. Boxes and manuals are always a bonus and thus will add some cost to the item. Most boxes were thrown away years ago. System boxes are sometimes available in $5-$20 range depending on demand, rarity and condition. ASK about system boxes if interested. 4) I already have the games but no boxes or manuals. Can I just buy the boxes and manuals? YES I have tons of orphaned manuals, and some boxes (not as many) waiting to be matched to your games. I usually charge $1 each. More for rare or high demand items. Please do not ask me to send you a list of manuals/boxes that I have, I can’t. I have thousands of them and for what I charge for them to make up lists would be so time consuming that it can’t be done. I need you to help me and send your list of what you need and try if at all humanly possible to alphabetize it by system. Searching through stacks and stacks of manuals is extremely time consuming. I hope to put all my empty boxes/manuals on my web page individually someday but it’s a long term project. They are currently listed for some systems like Atari, Coleco, Intellivision, Odyssey2 if you check the game lists, the manuals are at the end. 5) Are your systems new? Wow I hate when I get this question. NO!! If they are new I would state that they are new. We all wish we could get them new. A system I sell for $20-$30 can’t possibly be new. For that price NO how could it be new? Does this question need to be asked? 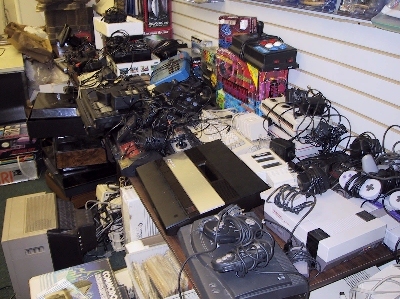 Vintage systems 10-30 years old would cost hundreds of dollars if they were new if you could even find one. They are used and yes they work, refer back to question 1. 6) How do I pay you? ANYWAY YOU WANT. Paypal, credit cards, checks, money orders, cash, etc. 7) How much is shipping? COMPLICATED ANSWER. When you go to the post office to mail a package they put your box on the scale and enter your zip code in to charge you. I am different from most online sellers as I make a living selling games. I don’t make a living on shipping charges. What they charge me I charge you. I need to know approximately what you want to buy and your zip code so I can weigh it and quote you. I don’t want to tell you a flat $5 then I pay $12 at the post office. I don’t want to tell you a flat $20 then pay $5 at the post office. Minimum charge is $2.50 for 1 game. 8) Do you ship to Canada, UK, France, Italy, Australia, Sweden, etc? YES EVERY DAY. I ship anywhere and everywhere. 9) How long will it take to get my order? DEPENDS on where you are and how hard your order is to work on. I try and ship same day I get paid or next day. I get tons of e-mails asking for things and some requests take more time than others. Transit time once I ship depends on how far away from me you are and how you want the order shipped. 10) Do you buy or trade? YES. Always buying. What do you have? 11) How do I know that I can trust you, are you a real business or is this all a rip off? You have to have some trust to buy on the internet. I have been in this business since 1992. I have been selling classic video games full time long before it was popular. Before EBAY even existed. My EBAY ID is collectorscardsandgames if you want to look up my feedback there. I can’t tell you how many systems I sell to people that already bought a system on EBAY, they got it and it didn’t work. They paid more than I charge and got ripped off since EBAY does nothing to help you. EBAY is filled with dealers selling their broken junk as “untested AS IS” and people that simply don’t know how to even plug the system in. “It looks like it works so lets say it works.” Customers come to me to trying to make their EBAY rip off work or to replace it. Trying to make life livable again, all these years without a Super Nintendo, now they finally got one on EBAY spent all this money and they still can’t play it. “If only I knew about your web page before I went on EBAY” I hear this EVERY SINGLE DAY. I really do. 12) Is my information secure? Yes, we don't give out your name, address, phone #, credit card # to anyone. We don't sell it or use it in any way except to fill your order. I won't be calling you to sell you insurance or to get you to apply for a collectorscardsandgames credit card, etc. I do not save credit card #s on my computer, information is filed away when the order is ships out and eventually destroyed. You didn’t answer my question yet. OK, e-mail me your question. The link is below. I usually respond within hours. You can also call to save time. Calls are only accepted 9AM-8PM Eastern Time.